For most of the year we forget about marshmallows. We break them out for s’mores when we go camping and we give them to our kids to shoot out of homemade PVC marshmallow guns, but mostly they’re absent from the popular consciousness. Which is fine because who really likes marshmallows? But then Thanksgiving rolls around and suddenly we’re putting marshmallows on sweet potatoes and mixing them into fruit salads and adding them to that jello thing with the canned oranges that Grandma always brings. None of the foods are really improved by the addition of marshmallows, but it’s tradition. It’s our heritage. And also it’s a Big Marshmallow marketing scheme to keep you purchasing their fluffy, gelatinous, more or less worthless candies to top your sweet potatoes, when you’d be much better off just sticking with brown sugar and pecans. It goes like this. Two brothers, Frederick and Louis Rueckheim—the guys who invented Cracker Jacks—start mass producing marshmallows in 1907. Ten years pass, and the two decide it’s time to stimulate some marshmallow demand. So (according to Saveur) they hire the guy who founded the Boston Cooking School Magazine to come up with a bunch of marshmallow-centric recipes, including—but definitely not limited to—marshmallow-topped sweet potato casserole. And people totally bought it. 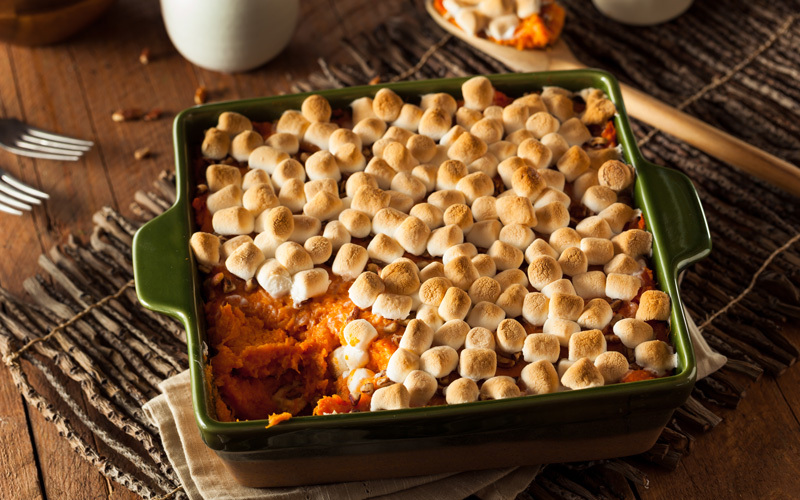 Later, the company circulated a second recipe booklet full of more #SponsoredContent advocating for the inclusion of marshmallows in all sorts of dishes where they don’t belong, adding insult to injury with a bunch more variations on the sweet potato casserole. Flash forward to like 100 years later and Aunt Tammy is literally sprinkling mini-marshmallows over a bed of candied yams as we speak. So now you know that your family tradition that has been passed down from generation to generation was made up by a corporation so they could sell you a product you didn’t want or need. Just like engagement rings. And Mothers Day. And the Transformers franchise. But just as engagements rings and Mothers Day and the Transformers movies have embedded in our culture, for better and (definitely) for worse, those weird marshmallow dishes are here to stay. They’ve become one of those unique cultural foods that carries meaning in spite of being kinda gross (like fruitcakes and mooncakes and other less-than-delicious seasonal treats). Because just as there’s something special about eating a turkey on Thanksgiving even though it’s the world’s worst meat, there’s something special about putting marshmallows in casseroles and jello salads once a year to signify that, hey, this is a meaningful time. And if Campfire® marshmallows is the primary beneficiary of our devotion to this uniquely American custom, well, so be it.